Luis Alcaide | “ The surprise in Spain is not only that Rajoy has gone, but that he hung on in power for so long” (Giles Tremlett, The Guardian). Corruption is a long-standing problem in Spain, benefiting the few and harming the many. But the rooted suspicion that no-one is clean has produced a certain resignation. Moreover there is the unity of the country and the growth in GDP. The ECB never enters into the equation, with its numantine defence of the euro, the purchase of the debt of the member states and the lowering of the risk premium. Spain, just like Greece and Portugal, emits debt at lower interest rates than the US. This lightens the burden of financing the deficit, and concealed expansionary policies are implemented, with more spending income and as a consequence more debt. Disposable income grows as does internal demand and employment. On the supply side, wage restraint and labour mobility, including making dismissals cheaper, reinforces the competitiveness of companies. Beyond our frontiers, the single market and the euro, which encouraged this strengthened competitiveness, support exports, resulting in uninterrupted growth year after year and a trade surplus with the EU and the Eurozone. The traditional tourists mix with those escaping insecurity in the competitor countries in the Mediterranean. And finally the icing on the cake of oil: external payments reduce and there is more disposable income to buy other products. Corruption is longstanding, going back to the origins of the bubble, and, who knows, the marriage of then Prime Minister Aznar´s daughter in El Escorial. The salary of the President of Telefonica (a semi public company) has increased 50 times from the 150,000 euros per annum that his predecessor earned. This extends to the directors and senior executives of all the companies listed in the stock exchange. Income inequality is accompanied by those resourceful businessmen who cannot save their companies but hang on to their wealth, while the hardworking in Catalonia and Castilla Mancha end up unemployed and the young take refuge in the homes of their pensioner parents. Podemos emerges and the independence of Catalonia is boosted. The president will not have it easy, despite the dacha in the Guadarrama, and the destructive fury of the separatists which has carried him the doors of a new government. Once over the threshold, the international scene is less welcoming. A trade war is lurking. Uncertainty in the financial markets depends on the interpretation of the new Italian government´s hostility towards the euro and the rules of the single market. At the same time the positions of the countries of the north and south of the EU are visibly moving apart. The oil price is rising from the 40 dollars a barrel of a few years ago. A gallon of petrol costs 3 dollars in the US, while the lorry drives and consumers rebel in Brazil. The fruitful alliance between the US and the EU breaks up as the ambitions of Russia and China grow. Sanchez will be monitored from every corner to see if he can count on the collaboration of a Spanish administration more independent than in the past. He will have to ensure an understanding with the Independent Authority for Fiscal Responsibility (budgetary imbalances and growth of public debt) and also with Brussels. His fellow citizens rate corruption, after unemployment, their greatest concern. They reject both the politicians and those businessmen who benefited from the discriminatory practices against the clean operation of competition (in Austria the politicians are not charged, only those who corrupt them). 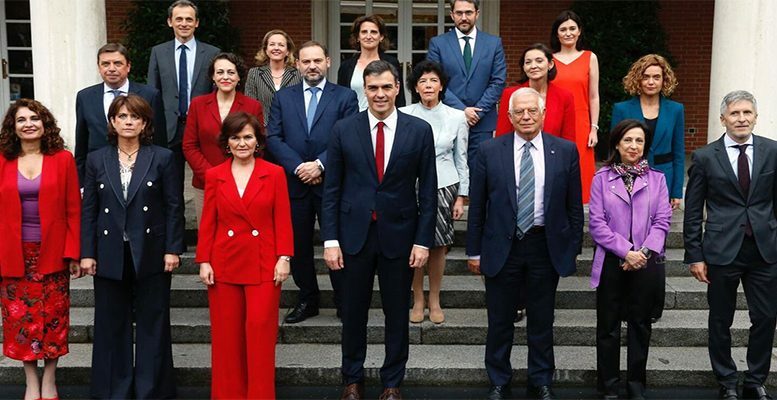 This is Spain and the world in 2018 in which president Sanchez will have to lead, with only 84 deputies. Good luck! He does not lack determination.